If you participated in the WNBR then I may have a photo or two of you. If you'd like these, then leave a comment or send an email to the address on my contact page. Each year the World Naked Bike Ride organises an awareness protest against the high levels of carbon emissions in our cities. 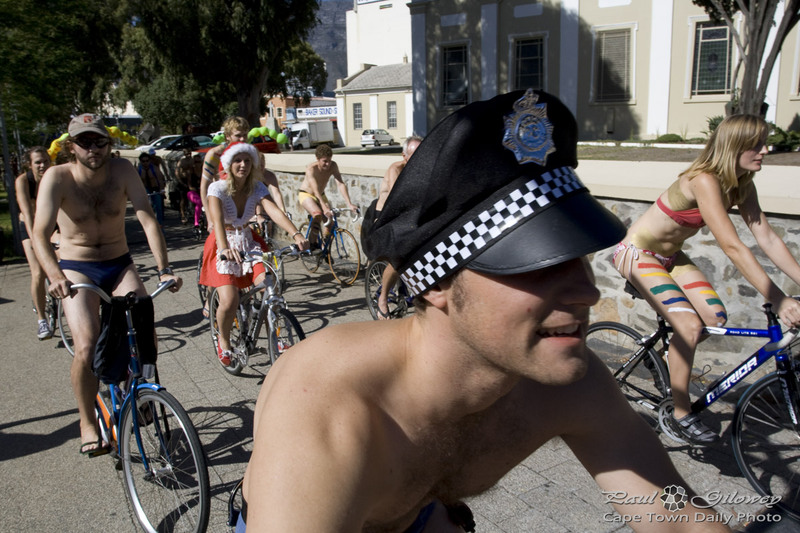 This weekend was, with Cape Town and the Argus Cycle Tour in fully swing, the perfect time to do so in Cape Town. I won't bore you with what we all know about carbon monoxide and the excessive use of combustible fuel, but what I guess is worth mentioning is that if Cape Town were legislatively a more bike-friendly city (like say Paris, Amsterdam, or San Francisco is) then we'd probably have fewer cars on the road, less pollution in the air, fitter-leaner friends, and more money to spend of the fun things in life, rather than on petrol and vehicle maintenance! The reality is though that even if a large proportion of the city's inhabitants became lean-mean-cycling-machines, the poorer folk who can't afford to fix their smelly-stinky vehicles will still drive smelly-stinky vehicles, the more affluent will still drive their large gas-guzzling 4x4s and muscle cars, and businesses trying to squeeze every penny out to survive still won't send trucks spewing black fumes to the mechanic or graveyard. All of this said, still, if we were able to make Cape Town cyclist-friendly, and if we were able to separate where cars, buses, and trucks ride from where cyclists do, it would go a long way to reducing our carbon footprint and creating healthier, happier people. Posted in General and tagged people, pollution, wnbr on Saturday, 9 March, 2013 by Paul NA. I totally agree with you. Luckily for me much money is being spent on cycling and cyclists in Sweden. some fun photos here. I’ll drop you an email Dewald.